Many Catalan beaches are losing their sand. Recent storms have starkly revealed this problem and the long term solution is a complex one. 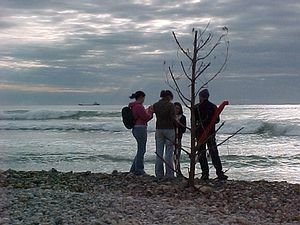 This study investigates the coastal processes, management and issues focusing on the threat to the Sitges beaches. Evidence for longshore movements and dominant wave directions can be gained through a study of pebble long axes and alignments. Hypotheses can then be applied to a study of the sand beach profiles. Comparisons of shingle and sand beach profiles. Evaluation of the success of the current coastal management schemes. This case study forms the focus of a recent Eurosion report on coastal erosion and management. This fieldwork assesses the beneficial economic impacts of the Muntanyans planning development against the environmental costs and examines the views of stakeholders and their conflicting needs. Field study methodology includes the use of conflict matrices, cost-benefit and values analysis and environmental impact assessments. Planning permission has been given for the construction of 550 homes, parks and facilities on the edge of coastal marshland and dunes at Els Muntanyans in Torredembarra. The development is located at the mouth of the Gibert torrent and covers the biological corridor that connects the adjacent beach and Protected Natural Area of Interest (PEIN), with the protected rural interior. The beach is the only large remaining natural beach between the Llobregat Delta to the south of Barcelona and the Ebro Delta. This fieldwork assesses the beneficial economic impacts of the Platja Llarga planning development against the environmental costs and examines the views of stakeholders and their conflicting needs. Field study methodology includes the use of conflict matrices, cost-benefit and values analysis and environmental impact assessments. Platja Llarga was a large area of coastal wetland and dunes, forming part of the delta of the River Foix. Today, although badly damaged, it remains one of the last undeveloped sites along the Catalan coast. The impact of human activity, the variations in biodiversity between managed and unmanaged dunes, and the success of dune management schemes. Contrasts may be drawn with the protected sand dunes at the nearby Llobregat Delta Nature Reserve. This fieldwork investigates the threats to fragile sand dune ecosystems along the coastline to the southwest of Barcelona. The construction of the Gav� coastal walkway aims to protect the dune ecosystem mainly by reducing extensive trampling. These field studies are supported with secondary data. Each study takes a full day, with the two coastal conflict studies (Els Muntanyans and Platja Llarga) combined.